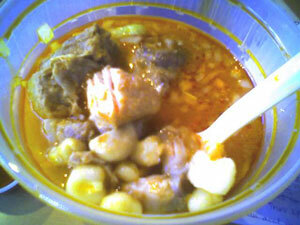 As promised, the report on the posole at Perez. Yum yum. Six bucks gets you two meals' worth of savory red-orange broth full of soft hominy and big melting chunks of pork. A shade bland, but squeeze in a few of the lime wedges and magically it's perfect. With tortillas & hot sauce on the side, along with raw lettuce & onions to add in for crunch and body. Seriously between this and pho I am starting to think that all broth soups should have lime juice in them, I love them so much.